“Citizen Science” is a movement that is growing around the world. It can be defined as the participation of non-professionals (including students, teachers, and individuals from the general public) who aid in data collection and analysis for scientific experiments. Although usually done under the supervision of a professional scientist, increasingly these amateur scientists even design the experiments and publish the results. There are several excellent examples. I had the privilege, as part of my participation in the NASA Explorer Schools program, to observe students at a middle school in urban Washington D.C. collecting data of loggerhead turtle movements in the Atlantic Ocean (from radio collar frequencies) and correlating that data with plankton abundance and ocean temperature gathered from an orbiting satellite. This program is called Signals of Spring. Other students track migratory waterfowl. I have had the opportunity to see the Telescopes In Education program in operation, where students at schools around the country use software to calculate the ephemeris of star locations on a given night and time, then communicate to a docent at the Mt. Wilson Observatory in California who slews a 24 inch reflecting telescope to view the location specified, then takes photos of that spot using the exposure times and filters the students specify and uploads them to the students’ computers. A 14 inch scope at the site is fully automated, and was being paired with a scope in Australia to view the southern skies. Using this system, students have access to the same data collection and stellar photography techniques of professional astronomers. 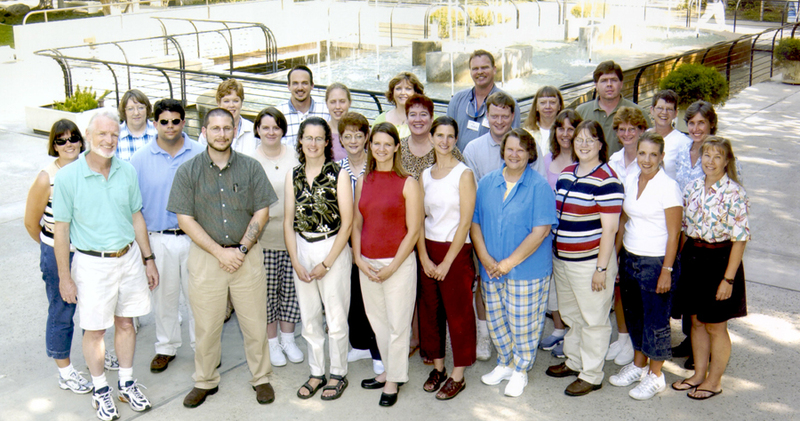 My own students participated in the Mars Exploration Student Data Team program in 2003-04 (described in my second post) to collect and analyze raw data acquired by the Mars Global Surveyor and Mars Odyssey space probes in support of the rover missions. They looked for atmospheric patterns (temperature, dust abundance, etc.) to predict possible dust storms or other meteorological events that could have disrupted the rovers. They then used their media design skills to create graphical representations and animations of this data, as shown in the image. Four of my students also participated in the Mars Student Imaging Program at Arizona State University, where they were allowed to select a spot to photograph on the surface of Mars using the Mars Odyssey spacecraft’s THEMIS camera. They then analyzed the image for signs of water or geological activity. 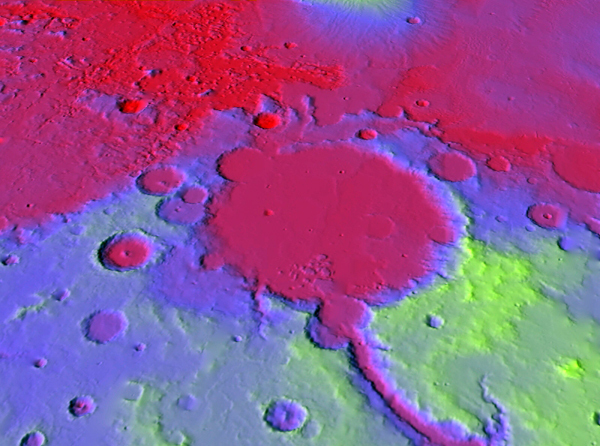 My students also download and animate 3D altitude data acquired by the Mars Orbiting Laser Altimeter on the Mars Global Surveyor spacecraft. Putting authentic data in the hands of students and the public allows for engagement and excitement in the scientific enterprise. 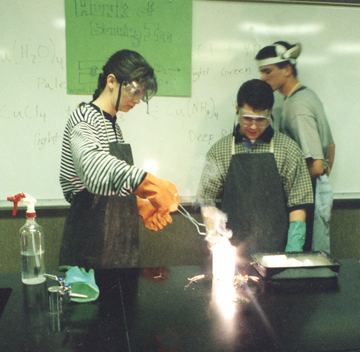 Students and other amateur scientists see themselves as participants and stakeholders, and become scientifically literate. This is one of the major purposes of The Elements Unearthed project. Although they will not be collecting new data in the form of a scientific experiment, our collaborating teams will be collecting new historical facts and developing their own interpretations. As citizen historians, they will add to society’s knowledge of the history and processes of mining and chemical production and make this information available to the general public. They will join the ranks of amateur citizen scientists that participate in professional-level data collection and analysis. Ultimately, the major problem is the divide in our society between those who do science and understand it and those who merely use the technologies it produces without understanding. We are becoming a technocracy; a population ruled by the few people who design, control, and maintain the technology we rely on. Numbers from the U. S. Bureau of Labor Statistics, May 2007 National Occupational Employment and Wage Estimates show a total of 1,255,670 physical, life, and social scientists (not including technicians) in the United States and 1,480,050 engineers. 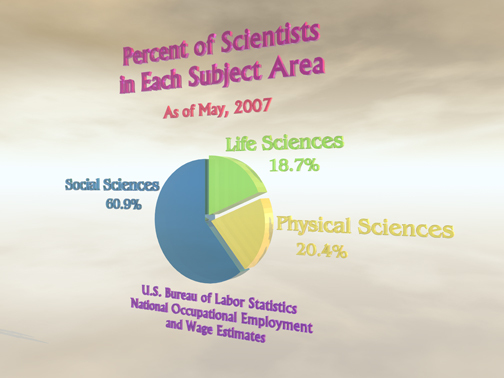 Of these scientists, 18.7% are life scientists, 20.4% are physical scientists, and 60.9% are social scientists. 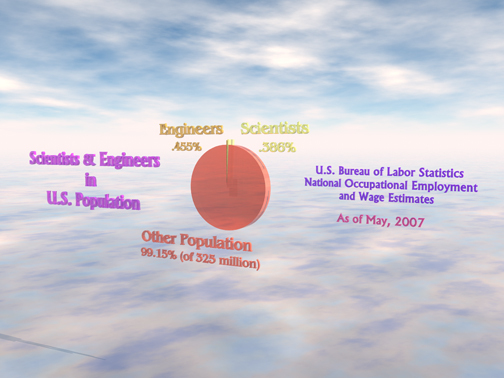 Altogether, scientists and engineers make up about .85% of the total U. S. population, or less than one percent. In other words, of 100 elementary students in school, only one of them on average will go on to a career as a scientist or engineer. Currently, this less than one percent of the population is the only segment actively engaged in creating science or technology; they are solely responsible for discovering the majority of the new knowledge and technologies our country relies upon. If we were to map out the relationship between the amount of fundamental new science created on a vertical axis and the percentage of the population involved in this creation horizontally, we get another steeply-sloped Pareto curve. For a discovery or technology to be considered “acceptable” professionally, it must be published in a reputable, peer-reviewed journal such as Nature. Usually only professional scientists with PhDs and years of advanced training in experimental design and statistical analysis can have any hope of being published. 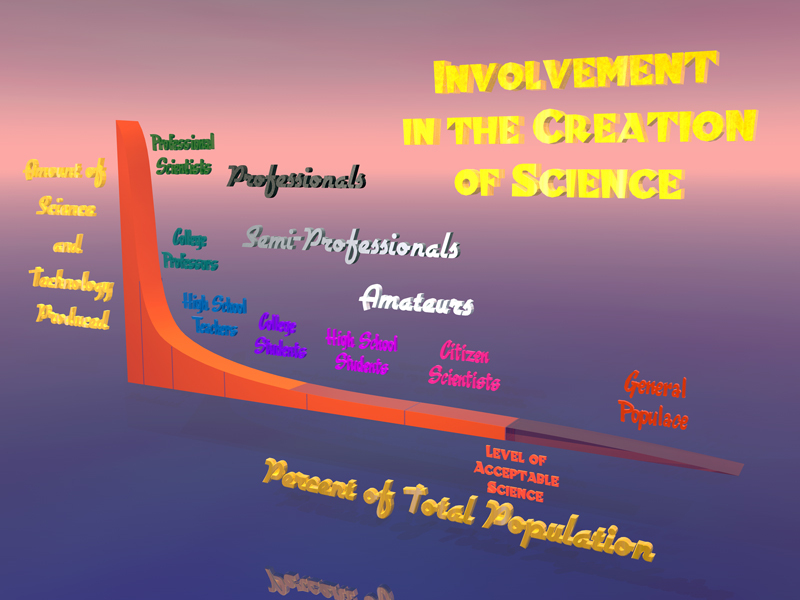 Yet beyond the narrow band of professional scientists and engineers lies a long tail of semi-professionals or generalists, including college science and engineering professors who are part-time researchers and high school science teachers, as well as amateur or “apprentice” scientists such as college and secondary science students and the “citizen scientists” in the general public. All of these people could potentially be creators of acceptable new science and technology if they were sufficiently trained and the rules were changed a bit. 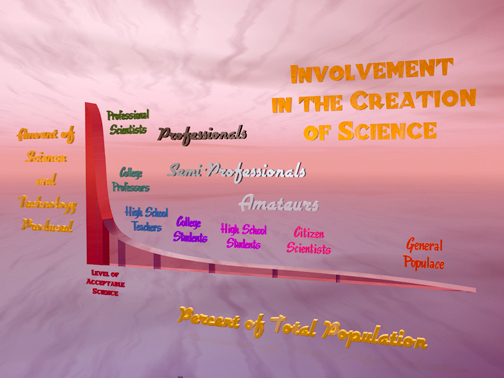 In the chart shown, the total amount of science produced can be represented by the area under the curve. What would happen, though, if we found a way to move the level of acceptability to the right to include science conducted by part-time researchers, generalists, teachers, students, and even “citizen scientists” in the general populace? We would dramatically increase the total amount of science done, and enlarge the depth and breadth of the research conducted. We would also engage a larger segment of the population. This would have secondary effects. As teachers, students, and the public get a taste of doing authentic, valid science, and become more experienced in data collection and analysis, they will tend to move to the left on the scale, becoming more professional. More students will become excited about careers in science, thereby increasing the number of science and engineering graduates and increasing the total output of science produced which will broaden the curve. As more of the general public gets involved, more people will hear about the possibility, get excited about it, and become involved and the border of participating population will potentially increase. Therefore, small effects in boosting the amount of “amateurs” doing science will have huge benefits in the total amount of science produced. Of course, there are many issues to resolve about how to train the amateurs and semi-professionals to do accurate, valid, repeatable science and to broaden the access of these studies to peer-reviewed publication. Podcasting, as in our Elements Unearthed project, can reach a broad audience but to gain professional respect such grass-roots research must be evaluated and mentored by reputable scientists and given the same scrutiny as any peer-reviewed study. If may seem daunting to attempt to increase participation in authentic science across the country. Surely our project can’t do this all by itself, but it can make a start and add to efforts already out there. If all we can do through this and other projects is to simply encourage one more student to pursue a career in science and technology out of every 100, we will double the amount of science and engineering done. This should not be too difficult a task. If we can involve the general public in data collection and make them scientists in that they learn to ask questions and observe nature to find answers, we will fulfill a fundamental human need to understand the world. This may very well be the most humanizing activity we can possibly do, and the most beneficially in the long run for humanity. A scientifically literate populace would make better decisions regarding resource allocation issues. Certainly it is a cause worth investing money and effort into. Through The Elements Unearthed project, we hope to engage students and communities. We will involve local scientists, engineers, and historians as subject matter experts; train teams of students and community members to become amateur science historians and video content producers; and generally increase the excitement of students to enter careers in science, technology, engineering, and mathematics. Through this we will contribute to preserving the history of chemistry, producing a scientifically literate public, increasing U. S. competitiveness, and helping individuals understand the properties and hazards of the materials they use. Last week I wrote about the need for and purposes of our project. This week let’s discuss our approach of training community teams to create the content of this project and why this will be beneficial. One purpose of The Elements Unearthed project is to train teams consisting of students and community members how to document the history and chemical processes of mines, refineries, and plants in their neighborhoods. Through on-site visits and on-line training resources, they will learn how to set up and use cameras, lights, and microphones; how to write preliminary and final scripts and storyboards; and how to film interviews and site visits, then edit the footage into a series of podcast episodes for use on the iTunes Store, YouTube, this blog, and elsewhere. They will also use desktop publishing software to write well-designed PDF files that can be downloaded and printed. Not only will our audience (primarily high school and college chemistry students) benefit by viewing and using the video, audio, and PDF files the teams create, but the team members will also benefit. They become experts in their subjects; as they learn the science and engineering well enough to pass it on to others through self-created, engaging content, they become the scientists, teachers, and historians themselves as well as learning valuable digital media skills. This project has aspects of both formal and informal science education; although we expect most of our teams to be centered around high school science classes where a mentoring teacher provides the impetus for the project, we want this to be much more than just another class assignment. In order to help the teams reach beyond what is easily knowable at their schools, and to ensure depth and accuracy, we will require that each team include someone from their community who is an expert at their chosen subject. This person could be a scientist or engineer at a local mine or refinery, an historian or museum docent with historical knowledge about the community, a local artisan who understands and uses materials in a workshop setting, or a citizen scientist who has gained experience with a local environmental concern. These community members will be referred to as Subject Matter Experts. Altogether an ideal team would consist of about four or five students from a local high school or community college, hopefully with a good mixture of course experience (history, art, multimedia, science, etc.). These students will have specific assignments, such as one student being responsible for writing the script, another planning the video shoot, another capturing and transcribing the footage, another creating B-roll images and animations, etc. All of them will be cross-trained in each other’s areas of specialty as well, but each area needs to have someone in charge. In addition, these students will be mentored by an instructor who will act as the primary point of contact. Finally, at least one Subject Matter Expert must be actively involved in reviewing the script and final video and helping with tours and interviews. Since most of the training, coordinating, planning, filming, and editing will be done outside of school hours and will involve more than just formal teachers and students, and since our podcasts will be available outside regular school curricula to anyone at any time, we feel this project qualifies well under the heading of Informal Science Education. Give a man a fish and you feed him for a day; teach him how to fish and you feed him for a lifetime; train him how to teach others how to fish and you feed a village forever. Build a man a fire and you keep him warm for an hour; catch a man on fire and you keep him warm for the rest of his life; catch a village on fire and you won’t have to worry about keeping anyone warm . . .
By turning students into experts and having them teach others, they learn the skills of data collection, interpretation, analysis, and synthesis. They learn how to be historians using direct first-person interviews. They become informed producers instead of consumers of content, actively instead of passively engaged in learning. We don’t just hand them a fish or build them a fire, we turn into the instruments to feed and light up an entire community. 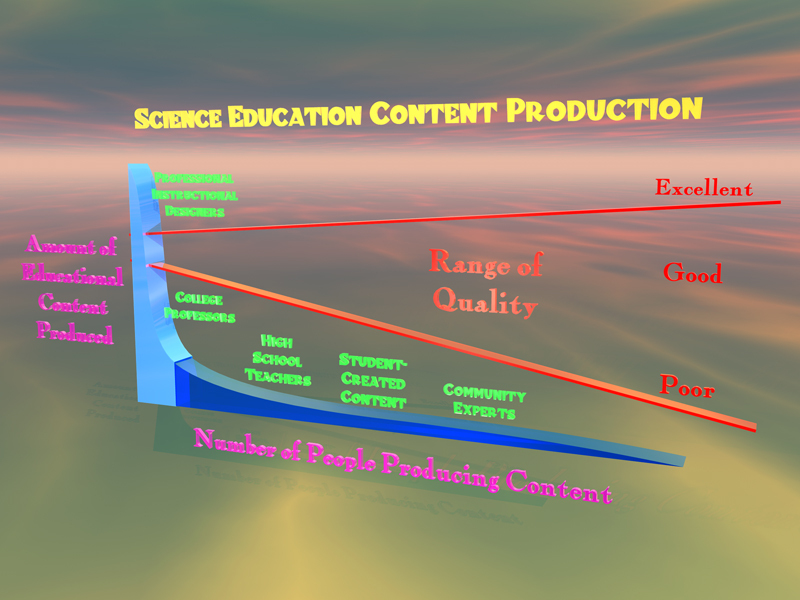 If we were to chart the amount of science education content produced on a vertical axis and the number of people engaged in producing that content on a horizontal axis, we find an interesting distribution called a Pareto curve, having a steep drop off on the left trailing off to a long shallow curve that never entirely reaches zero on the right. Currently, most content for science education is produced by a few professional curriculum designers and publishers. Some college courses are created with a professor contributing expertise and an outline of topics then handing the course design over to the college’s Instructional Design department to build the curricular pieces and content. Occasionally a high school teacher might act as a co-author or reviewer of a textbook, yet the vast majority of curriculum, lesson plans, tests, and texts are still created by professionals with years of training. Yet a long tail exists of semi-professionals and amateurs, including teachers and students and even experts in the general public who can contribute content that is equally valid (and much richer in subject matter and variety) than the professionals. If this tail could be tapped, the total content available would drastically increase, as shown by the area under the curve in the second diagram. By providing more choices and sources for information on chemicals and the elements through generating our own video podcasts, we hope to enrich the education of science students and the general public and make this information more accessible (and less expensive) than it is now. We will use podcasting as our format because it encourages and motivates students to become producers instead of consumers of content without having to worry about publishers, agents, textbook costs, shelf space, and other barriers to access created by the economics of scarcity of our current situation. On-line publishing allows virtually free storage and distribution without limits to the variety of content that can be displayed. There are no shelves to allocate, no exorbitant publishing costs. This pushes the available content down into the long tail and increases choice; anyone anywhere at any time can access and view our podcasts – all they need are an internet connection and a computer or mp3 player capable of playing the videos. 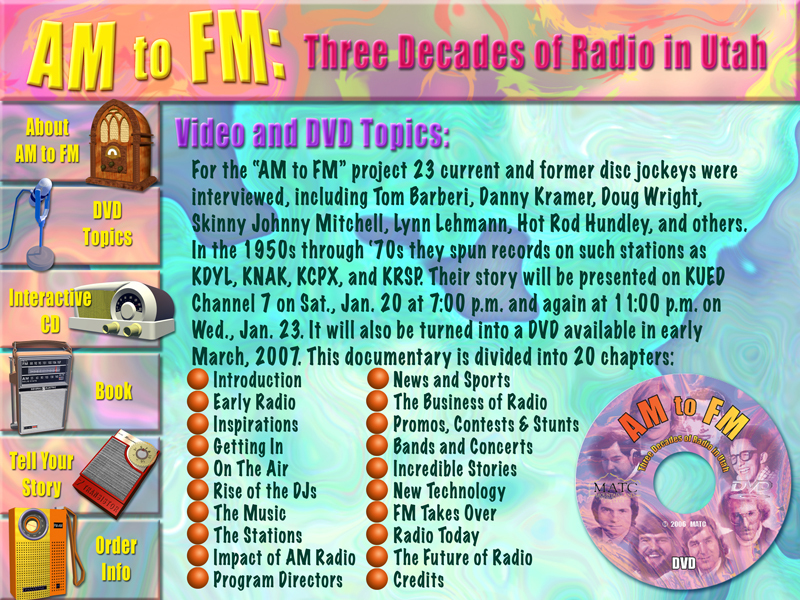 Video also allows for deeper information transmission through a visual and audio medium rather than what audio or print alone can do. The major issue will be whether or not teams of students and subject matter experts can build professional quality videos and written documents that will be technically solid, compelling, and appealing as well as accurate. 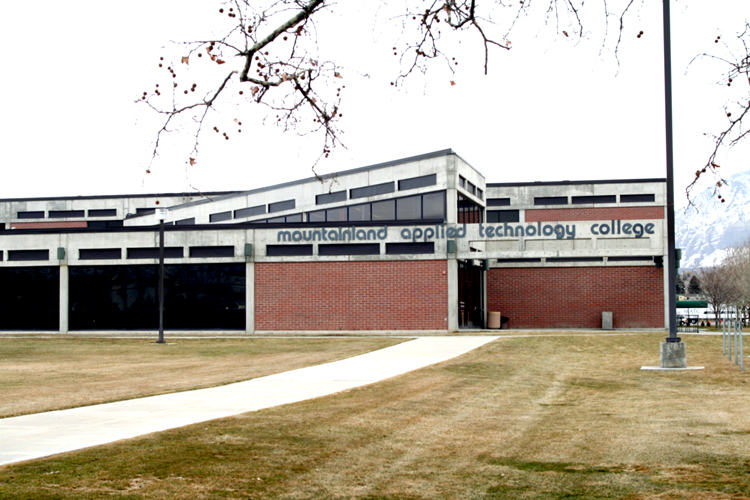 Our early trials at Mountainland Applied Technology College indicate that it can be done. When amateurs get involved and empowered to create their own content, we see a broadening of the range of quality that is produced. Although there is certainly a great deal of low quality content, there is also the potential for creating materials that are of higher quality than what is done “professionally.” On the chart shown, this is represented by the lines indicating the range of quality. When content is produced professionally it is done by teams of writers and designers and approved by committees and written for the lowest common denominator. Textbooks may be generally of good quality, but they are never great. You wouldn’t read one for fun because it is well written or so gripping that you can’t put it down. Textbooks take so long to write and publish that their content is already obsolete by the time they make it to schools. Yet content produced by individuals and small teams has the potential to be gripping and relevant and topical. It also has the potential to be awful. Our challenge is to provide the training necessary to ensure the former. There are four reasons why The Elements Unearthed project is needed. The first is for our own self-protection. The second is to protect our heritage and history. The third is to protect our future. The fourth is to protect our country’s standing as the leader in science and engineering innovation. Our lives are impacted by chemicals, materials, and the elements every day, yet too many people are ignorant of the extent to which we interact with the elements. Let me give three examples. 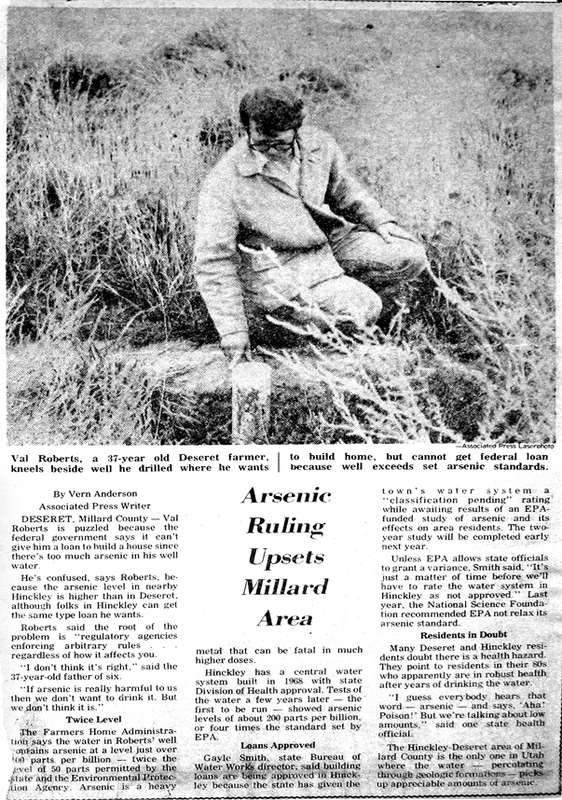 A – In the summer of 1978, residents of the small town of Deseret in west central Utah were alarmed to find out that high levels of arsenic had been discovered in their drinking water, at over three times the EPA allowable limit. Each house in the town had an individual well dug down to an aquifer 186 feet below ground and it was this level that had become contaminated. No one knew where the arsenic had come from or how long it had been there. Extensive tests were given to the townspeople. I went through those tests myself, and they were quite uncomfortable – especially the nerve conductivity tests! The original medical study was published in 1982, with inconclusive results. A longitudinal study of mortality rates of people in the area was published in 1998 and showed a correlation between arsenic exposure and increased incidence of hypertensive heart disease, nephritis and other kidney problems, and prostate cancer. My own grandfather, who had lived in Deseret all of his life, died of prostate cancer, possibly as a result of arsenic exposure. B – In one week in December, 1996, three separate incidents occurred in Utah that involved toxic chemical spills. The first was a railroad car carrying diesel fuel that spilled its load and caught on fire. The second was an 18 wheeler traveling north on Interstate 15 that blew over in a gust of wind just north of the town of Nephi. It was carrying sodium azide for use in car airbags, and when rainwater mixed with the spilled azide, it burst into flames that were so hot that it burnt a hole down through the roadbed and sent a plume of gray smoke toward the town of Mona. Residents were evacuated and traffic on I-15 was diverted 30 miles out of its way onto an alternate road. The next morning another 18 wheeler spun out on slick surfaces on that alternate route and overturned, spilling its load of sulfur dioxide pellets. Traffic was again diverted onto yet another alternate route over 50 miles out of its way. I was living in Nephi at that time and had to travel these alternate routes to get to work. In Utah they called this HazMat Hell Week. 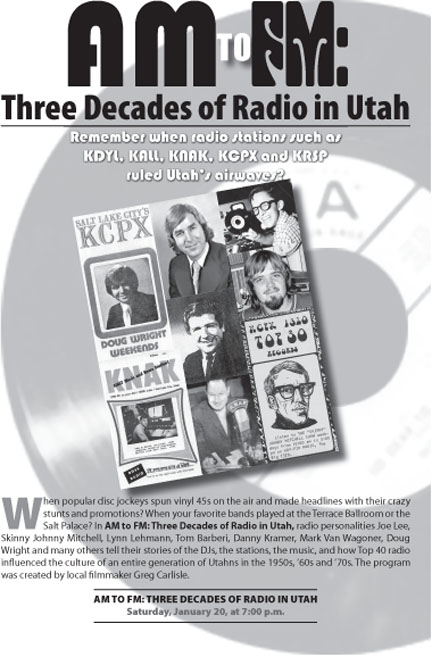 C – Growing up in western Utah in the early 1960s, I was exposed to fallout blown downwind from the nuclear testing in Nevada. Since my family milked its own cow that was kept in a pasture behind our house, the cow ate alfalfa that was contaminated by radioactive iodine-133 from these tests, which was concentrated in the cow’s milk. I have been told that I should have my thyroid gland checked regularly in case I develop thyroid cancer as a result of this fallout. These are just three of many examples of how chemicals and materials have influenced my own life. Millions of tons of chemicals move across our highways and over our rail system each year. People store potentially dangerous chemicals in their own homes without much understanding of what they are used for or how to handle them safely. Water and food can become contaminated. We need to understand how chemicals work and where they come from if we are to keep ourselves safe. The Elements Unearthed proposes to provide the information that people need on the hazards and uses of chemicals and materials. Human history is tied directly into how well we have understood and used the material world we live in. Epochs of our history are named after advances in materials science, including the Stone Age, the Copper Age, the Bronze Age, and the Iron Age. The Elements Unearthed project intends to dig up the story of how our history and the discovery of the elements have been dependent on each other. Much of the history of the United States has been influenced directly or indirectly by materials and chemicals, by mines and miners, with such events as the Spanish conquest of the western United States, the California Gold Rush, the Comstock Lode in Nevada, the coal mines of West Virginia, the steel mills of Pennsylvania and Ohio, the Pikes Peak rush in Colorado, and the Klondike Rush in Alaska all adding to our national character. Yet much of this history is being lost, as mines close and the miners that worked in them die away. 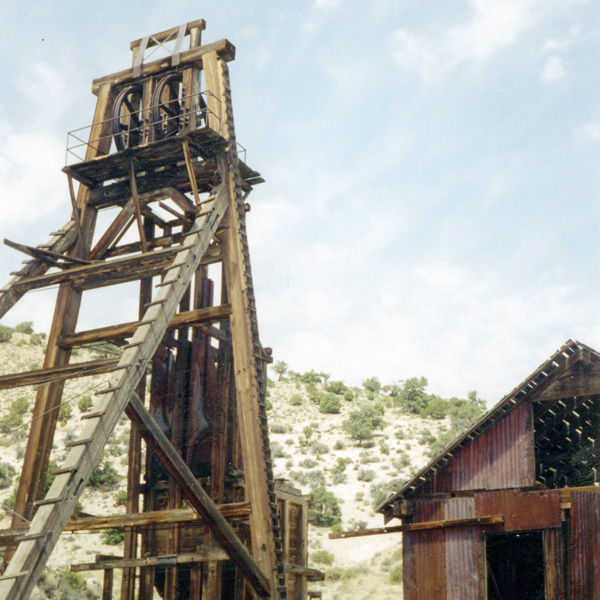 Virtually gone are the days of panning for gold or hard rock mining with pick and shovel. Old mine sites are being closed and covered for safety and environmental reasons, and this part of our history is in danger of being lost forever. Our project is needed to preserve this history and tell these stories. As we face tough choices now and in the near future regarding how we use our resources, generate our energy, transport, feed, and clothe our population, and improve our environment, we must have an informed public that can support and vote for the policies that will protect our increasingly fragile world. Resource depletion, environmental degradation, energy consumption, and global warming are daily headline news, and national leadership and public awareness must begin to focus on these issues. Decisions must be made now; we cannot continue to “kick the can” down to future generations. Education and public awareness must focus on accurate, unbiased information, and our project intends to provide that information in various formats and locations that are free and easy to access by the public at large and particularly by high school and college students and their teachers. The solution to this problem of an informed populace lies in education, both formal and informal, and that is the main purpose of our project. The U. S. economy has been the envy of the world for decades. Although it is still very strong, many experts are beginning to see signs that we may not be as competitive in the near future as we have been in the past. The major driver of our current strong economy has been innovations made in the computer industry over the last 30 years, coupled with new technologies that computer control and automation have brought us. Yet to maintain our economy in the future, we must continue to innovate and there are doubts that we will be able to do so, especially as the world economy becomes more globalized and competitive. One of the largest danger signs has been a decline in students prepared to pursue careers in science, technology, engineering, or mathematics (STEM). 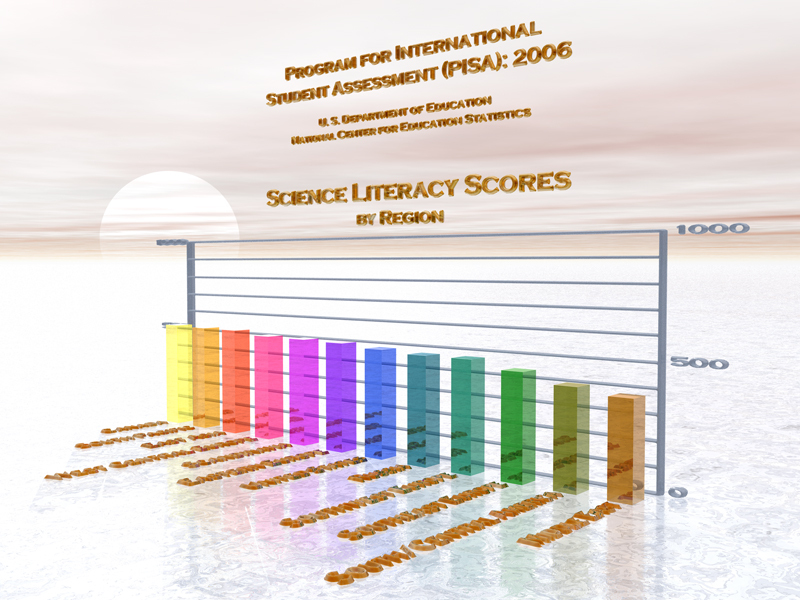 In 2006, 15 year old students in 57 countries around the world were tested on their science literacy by the Program for International Student Assessment (PISA). The average score was set to be 500 out of a total possible score of 1000. The results have been summarized in this chart by region. In science literacy, students in East Asia, Canada, the South Pacific, Scandinavia, and Western Europe all scored significantly higher than students in the United States, who scored 489 or below average. Overall ranking of United States students was 29th out of 57. Students in Russia and Southwest Europe scored slightly below students in the United States with average scores of 479 each. Students in Southeast Europe, South and Central America, and the Middle East on average scored worse than students in the United States. 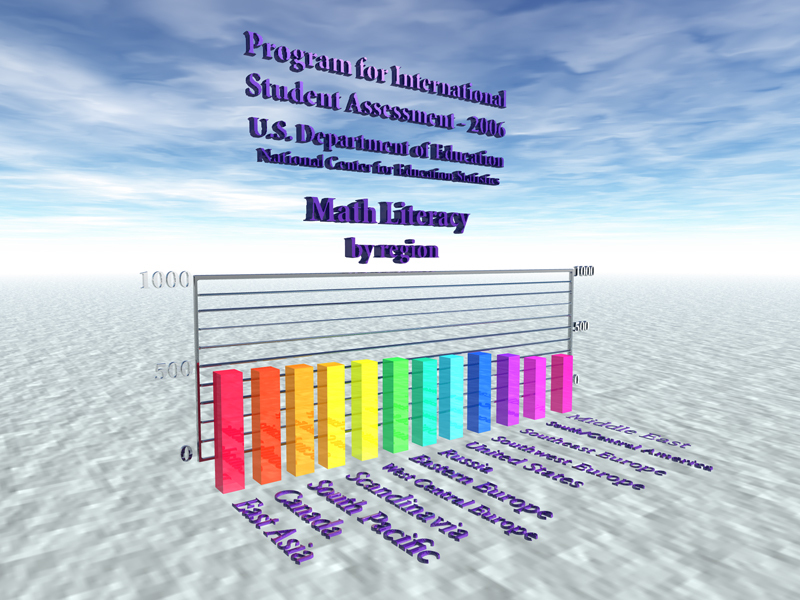 The 2006 exam also tested for math literacy and found U. S. students to be 35th out of 57 with an average score of 474 compared to 538 for East Asian countries, 527 for Canada, 512 for Scandinavia, and 510 for Western Europe. Only Southwest Europe, Southeast Europe, South/Central America, and the Middle East regions scored worse that the United States. These scores show that we are not doing well at preparing the next generation of scientists, engineers, and mathematicians. A full 30% of incoming freshmen must take remedial science and math classes just to meet college general education requirements, let alone have the background skills needed for technical majors. In addition to poor preparation and knowledge, fewer students choose to enter STEM professions, with enrollments in science and engineering programs at colleges declining and graduate programs having to look to foreign students to fill their ranks. Many U. S. businesses that rely on a steady stream of STEM graduates are already finding it difficult to recruit enough adequately prepared people. For example, NASA hired many aerospace, civil engineering, and materials science graduates during the 1960s and ‘70s. Now almost 40% of NASA’s technical workforce is set to retire in the next 15-20 years, and there are not enough U. S. students in the education pipeline to fulfill the coming shortage, nor is NASA allowed to hire many foreign graduates for national security reasons. In the past, shortages in technical fields could be made up by hiring non-American graduates, but now with security restrictions and new jobs being created in their homelands as a result of globalization, many of these foreign recruits are no longer available. Some businesses are taking matters into their own hands by supporting programs that would help to train their future recruits, such as direct grants to schools, challenge competitions, or teacher professional development programs. NASA has created the NASA Explorer Schools (NES) program to train teams of teachers and administrators from schools and to provide direct grant support to improve their science and technological infrastructure. As mentioned in my previous post, I have had the privilege of participating in this program, first as a teacher, then as an Educator Facilitator to help lead and plan the workshops at the Jet Propulsion Laboratory. 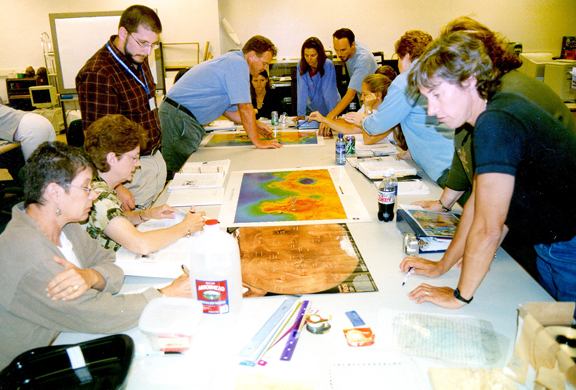 Each year, five teams of five teachers and administrators visit JPL for a week-long workshop. They tour the facilities, meet the scientists and engineers that are designing, building, and running the space probes, learn of NASA’s educational programs through the Education and Public Outreach coordinators for each mission, then work as a team to plan how they will incorporate these experiences into their curriculum. NASA personnel then work with the schools over a three-year period to promote systemic change in the hopes of inspiring the next generation of explorers, scientists, and engineers. Our project will encourage students to pursue careers in chemistry, chemical engineering, and materials science by showing firsthand what scientists do, how problems are solved by engineering, and how creative, challenging, and rewarding these careers can be. Below is an Enhanced Audio podcast episode describing our project in more detail. Next week we will have additional information and statistics about why this project is so important, as well as a video podcast describing the entire rationale of The Elements Unearthed.